As Katie pointed out in the comments of the last post, it is indeed about time for an update. We've had a fun but busy month so I'm just going to bullet point the highlights. The weekend of the seventh, Angie and I celebrated our five year wedding anniversary. Our anniversary isn't actually until this Friday, the 27th, but we knew things would be crazy around then. We had an awesome weekend to ourselves at the W hotel and did a lot of relaxing, talking without ever having to try 6 times to get a full sentence out before being interrupted and a lot of eating without having to clean up or apologize to a waiter for the food on the floor. I did have Angie throw her vegetables over the side of the table every so often just to make it feel a little more like home. While we were enjoying the time together, Patrick was with his Meme and Papa Joe and, as always, loving every second of it. The next weekend, we had some painting to get done in Madelyn's room. (Yes, that's the final name and spelling of the name. More on that below). We dropped Patrick off in the morning with his Grandpa and Grandma Flowers and went back to our house to start the fun. We quickly realized that we had done absolutely NO planning at all for the day and still had to put a tarp down, bring the paint up from the basement, make sure we had rollers, etc. You think we wouldn't be this out of practice since we just did this for Patrick's room a couple years ago. In the end though, we got the whole room primed (it was a deep blue color before and now it'll be a light pink on 3 walls and a greenish/grayish/bluish color on the other wall), the ceiling painted and all the carpets in the house shampooed. 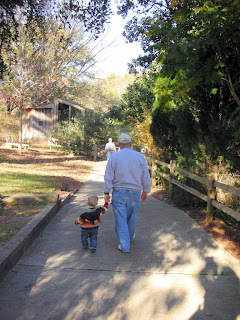 While we were painting, Grandma and Grandpa took Patrick to the Chattahoochee Nature Center where he got to see turtles, bald eagles, beavers and, his current favorite, owls. He had a really fun time and the next day was still telling us about the animals (he woke up saying "whoo! whoo!" and "beafer"). Last weekend, we went to the Suskay Cabin to celebrate Abbie's birthday. It was nice to be with everyone including our friends Betsy and Travis who came in from North Carolina. We spent Saturday on a long hike (much longer than Matt had told us it would be. Abbie, make sure to remind him of that.) to see the Raven Cliff Falls. The hike was beautiful, the weather was perfect and Patrick enjoyed seeing everything from way up high in the backpack. We carried him the whole way in and then let him run around and climb on the rocks once we got to the falls. He also discovered moss and became fixated on trying to get it off the tree with a stick. He loved climbing the rocks though and sitting on them all by himself. One of our favorite things in life right now is seeing him be proud of himself and we got to see a lot of that while he was climbing on the rocks. It was very cute. And that pretty much brings us up to now. We're excited about Thanksgiving being this week and the time it means we get to spend with each other. We're spending Thursday with my family and eating at my Aunt Ellie's house that night and then leaving Friday afternoon for the cabin and doing Thanksgiving up there with the Suskays. Also, in the "very exciting news" department, Katie and Brandon will be having their little girl, Carson Danielle, on December first! It's hard to believe it's only a week away and that by this time next week, they'll be parents of a little girl. We're really happy for both of them and can't wait to meet our new niece. Please say a prayer next Tuesday that everything goes well during delivery and a speedy recovery for Katie. As for our own bundle o' joy in the works, we DID decide on the name during our anniversary weekend. Her name is Madelyn Claire. She's been super active lately and now that she's getting bigger we can see and feel her move more than ever. Angie's doing great with the pregnancy and is handling the 27-weeks-pregnant-and-chasing-a-16-month-old-around-and-working-part-time thing extremely well. She really teaches me more and more about patience every day. We created a photo album for the month of November. There's the slide show beneath or you can view the whole album at once by clicking this link. We hope everyone has a very fun and safe Thanksgiving!